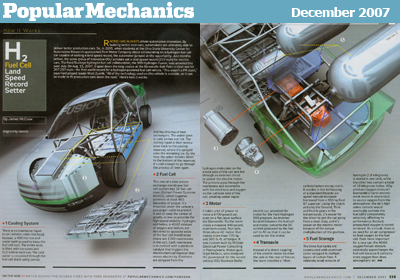 The December 2007 issue of Popular Mechanics features an article on the Ford Fusion 999. "By building better race cars, automakers are ultimately able to deliver better production cars. So, in 2005, when students at the Ohio State University Center for Automotive Research approached Ford Motor Company about collaborating on a hydrogen fuel cell car capable of setting a land speed record, the automaker jumped at the opportunity. Just months before, the same group of innovative OSU scholars set a land speed record (315 mph) for electric cars. The Ford/Buckeye hydrogen fuel cell collaboration, the 999 Hydrogen Fusion, was unveiled this past July."